↑ "California Cities by Incorporation Date" (Word). California Association of Local Agency Formation Commissions. पहुँचतिथी August 25, 2014. 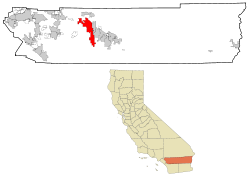 ↑ "2010 Census U.S. Gazetteer Files – Places – California". United States Census Bureau. ↑ 3.0 3.1 "Palm Springs". ज्याॅग्राफिक नेम्स इन्फॉर्मेशन सिस्टम. यूनाइटेड स्टेट्स भूबैग्यानिक सर्वेक्षण. पहुँचतिथी नवंबर 11, 2014. ↑ 4.0 4.1 "Palm Springs (city) QuickFacts". United States Census Bureau. पहुँचतिथी फरवरी 11, 2015. ↑ "Parks & Recreation". City of Palm Springs. पहुँचतिथी 28 अगस्त 2014.